Jamie Davis presents information about our new teacher induction program to the board of education. Speaking of Jamie, at our meeting on Monday she reported on the progress she is making in her new role as probationary teacher coach. This position was established this year through use of Title II grant funds aimed at supporting new teacher transition into our school district. We suspect Jamie's effort will go a long way toward attracting and retaining great new teachers to our district. We have committed to doing this work because Jamie is uniquely qualified, and because we recognize the importance of doing all we can to place highly effective teachers in our classrooms for the benefit of our children. Finally, at our board of education meeting the CDE Office of School Nutrition recognized Kristi Elliott, Heather Williams and the nutrition and wellness teams at Canon City High School, Canon City Middle School, Canon Exploratory School, Harrison School, Lincoln School of Science and Technology, McKinley School ,and Washington School for their effort toward improving student health and wellness by meeting the Healthier U.S. School Challenge: Smarter Lunchrooms criteria. This is a rigorous certification initiative open to all schools that participate in the national school lunch and breakfast programs. It rewards schools that play a vital role in promoting student wellness as a leading contributor to student achievement. In acknowledgement, each of the schools received a bronze award plaque, a banner, and a $500 award. 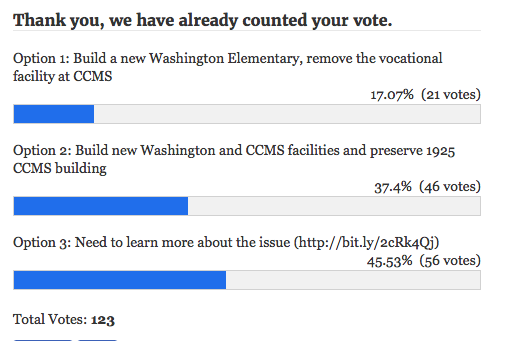 A recent Cañon City Daily Record poll shows a little more favorability toward our option to build both new Washington and CCMS structures. However, nearly half of respondents would like to learn more about the options. I encourage community members to attend our October 10th board meeting to learn more about these facilities options. Last week our board of education decided to continue consideration of two facilities options, one which would build a new Washington Elementary School on its current site while demolishing the old one and removing some excess square footage from CCMS. However, an additional option was proposed by board secretary Mary-Kay Evans that would also call for constructing a brand new CCMS building on the CCMS property, while pursuing further demolition and possibly repurposing the original 1925 high school structure. The estimated cost for the Washington project, if we can secure a BEST grant to help fund it, would be just under 10 million dollars to our taxpayers. This option remained on the table because surveys distributed to Washington and CCMS parents, as well as many emails received by our board members, indicate a desire to keep Washington Elementary where it is, while also pursuing building a new facility there. Mary-Kay’s option surfaced as a result of board members receiving feedback indicating the public is not comfortable with any plan that would tear down or abandon the 1925 section of Cañon City Middle School. Thus, she proposed an option that would provide a new facility for Washington students while also tearing down all parts of CCMS that were added after the 1925 core was built and building a brand new CCMS building on current CCMS property. The total cost of this plan to taxpayers, if a BEST grant could be secured, would be around 15 million dollars. The board will be holding public hearings on these facilities options during the month of October with the goal of making a decision as to which direction to seriously pursue by November 1st. I encourage all interested community members to attend our October board meetings to learn more about our situation. On Monday I attended our Literacy Team Professional Learning Community session where we began work on a literacy coach evaluation document. On that day I also met with board president Larry Oddo over lunch and in advance of our board work session and meeting that evening. Tuesday was filled with a series of meetings with directors and facilities experts, including our architect of record. I ended Tuesday in a Facilities Corp board meeting. On Wednesday I attended a regional health and wellness grants progress meeting, met with CCHS principal Bill Summers about a variety of topics, and met with McKinley principal Drenda Manning about an administrative internship she is supervising. On Thursday I had a meeting about our Expelled and At-Risk Student Support Services grant, and then met with Cañon City Daily Record reporter Sarah Knuth about our facilities options. In then spent time with our CDE Early Literacy Grant consultant, and then conducted a District Evaluation Council meeting. On Friday morning I worked on budgeting issues related to our Early Literacy grant with director of instruction Adam Hartman and district literacy coordinator Gina Gallegos. I also met with construction experts about our upcoming BEST grant application, and then spent the afternoon learning about new federal education programs requirements. Carol Dominguez was honored by the board of education for her work encouraging CCSD students to read. Monday began in an all staff meeting at McKinley Elementary School, as well as with time spent writing this communication. My afternoon will be dedicated to catching up on communication items. On Tuesday I’ll start my day on Morning Line at KRLN Radio, then I’ll meet with my Superintendent Advisory Council. I’ll spend the rest of the day Tuesday traveling to and from Denver for the quarterly Colorado Safe Schools Resource Center advisory board meeting. I’ll begin Wednesday in a monthly meeting with our central office staff, followed by a meeting with director of special services Lynnette Steinhoff, and then our district operations staff. I will spend Wednesday afternoon greeting UCCS education students and then taking them on a tour of several of our school buildings in an effort to attract soon to graduate teachers. On Thursday morning I meet with RE-2 superintendent Rhonda Roberts, and then probationary teacher coach Jamie Davis before conducting another director evaluation and attending a Cañon 2020 visioning meeting. I will be in Denver again on Friday attending an Early Childhood Leadership Commission retreat. However, I hope to be back in Cañon in time Friday evening to watch our Lady Tigers play in their annual parent recognition softball game.